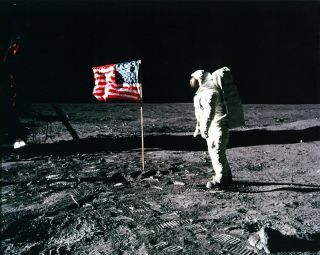 LONDON — In 1969, the world watched in awe as astronauts from Earth walked on the moon during NASA's historic Apollo 11 lunar landing. And while five more Apollo moon landings followed in the years to come, the era of manned moon exploration ended more than 40 years ago. No human has walked on the moon — or any other celestial body — since Dec. 14, 1972, when astronauts Eugene Cernan and Harrison Schmitt blasted off the lunar surface during Apollo 17, NASA's last manned moon flight. "The samples collected four decades ago by NASA's six successful Apollo missions are very valuable, but the collection is merely from six landing sites, all on the near side of the moon and all close to the equator," said Ian Crawford, professor of planetary science and astrobiology at Birkbeck College, University of London, after a talk here at a recent Royal Society conference on the origin of the moon. "We now know that the moon is geologically diverse, so the Apollo collection isn’t really representative of the whole moon," Crawford added. In addition to NASA's Apollo missions 11 through 17 (with the exception of Apollo 13, which had to return without landing), three Russian robotic probes also touched down on the moon's surface and brought rocks back. These were the Luna 16, 20 and 24 spacecraft. But all of those early lunar missions, manned or unmanned, only returned rock samples found directly on the surface. The samples were collected from the dusty layer of pulverized lunar rock — the so-called regolith, a product of meteoritic bombardment. Regolith consists of microscopic particles about 0.01 millimeters in size, making it a mixture of fine dust and rocky debris that resembles ready-mix dry mortar. It covers the moon's landscape to an average depth of several meters. "We don't have any samples of the bulk interior of the moon, just those that have been scraped off the present lunar crust," Crawford said. And this, he argues, is simply not sufficient to understand the composition of our satellite and solve the riddle of its origin. Are the moon and Earth isotopic twins? Today, the prevailing theory is that the moon formed some 4.5 billion years ago, when a mysterious planet-size body dubbed Theia slammed into the baby Earth, blasting out material that ultimately coalesced into the moon. But even the supporters of the so-called giant impact theory — which includes the majority of moon researchers — still admit that the idea has loopholes. One such loophole involves the isotopic similarities between the Earth and the moon, which suggest that the moon is more like a dwarf twin of Earth than a mix of our planet and a big impactor. "All these isotopic comparisons, trying to assess the similarities and differences between the Earth and the moon, they are not quite comparing like with like at the moment," Crawford said. "In terms of trying to compare the bulk composition with the Earth, it's the mantle composition that really counts because the crust is just this thin layer on the top." "And we don’t have any samples of the moon’s mantle," he added. Although limited geographically, NASA's Apollo moon landing missions did manage to obtain samples of different lunar surface compositions. For instance, the rocks from the moon's crust, the highlands, are rich in aluminum, lighter in color and less dense than the basalts of the maria — large smooth areas thought to be ancient, solidified oceans of molten lava, ultimately derived from the mantle. The maria mostly exist on the near side of the moon. Scientists think that the moon's maria basins formed during the final stages of a heavy meteoritic bombardment between 4.1 and 3.9 billion years ago. Sometime later, the battered moon underwent volcanic eruptions, which filled these basins with lava and created the formations of the current lunar landscape. There are also many impact basins that were never flooded with lunar lava, almost all of them on the far side of the moon. And it is there, Crawford thinks, where we should send a future lunar mission aimed at examining a deep crater on the far side and collecting samples of the lunar mantle. "We need to find sites like the South Pole-Aitken basin on the far side of the moon; that's the deepest impact structure in the solar system. There may be mantle samples waiting to be found there, which could greatly help our Earth-moon comparisons," Crawford said. The South Pole-Aitken basin is a deep impact crater that measures about 1,600 miles (2,500 kilometers) in diameter and is some 8.1 miles (13 km) deep. A mission to the far side is difficult, though, because the moon's rotation coincides with its orbit around our planet. As a result, its near side is effectively tidally locked to Earth. In 1959, scientists obtained their first glimpse of the far side of the moon, thanks to the Soviet Luna 3 probe. It took nearly a decade until human eyes looked at the permanently hidden side, when Apollo 8 orbited the moon in 1968. However, all lunar landings — manned and unmanned — have touched down on the moon's near side. But what about lunar meteorites that have landed on Earth? Surely some have come from the far side? Manesh Anand, a researcher at the Open University in the United Kingdom, says that it is impossible to pinpoint the exact origin of lunar meteorites, but that they have helped broaden our knowledge of much larger geological and geochemical variations on and in the moon. "New sample return missions from geologically diverse and previously unvisited areas of the moon are required to develop a robust understanding of the origin of the moon and that of other terrestrial planets in the solar system," Anand said. Currently, Russia and China aim to send robotic landers to the lunar surface in the next decade, but both aim for the near side yet again. And there are still no firm plans to send astronauts back to the moon in the near-term future. As a result, Crawford said, none of the forthcoming moon missions are likely to help scientists understand how the moon was created. Future lunar exploration should be done differently and be more ambitious, he added. "Instead of landing and just grabbing stuff, which is basically what Apollo did, there are specific scientific questions the moon can tell us about," Crawford said. "But they require going and sampling at specific localities or deploying specific instruments. Maybe in a decade or two, we'll have such a mission. "In the longer term, lunar exploration would really benefit from once again having people on its surface, perhaps operating out of a lunar base similar to those in Antarctica."